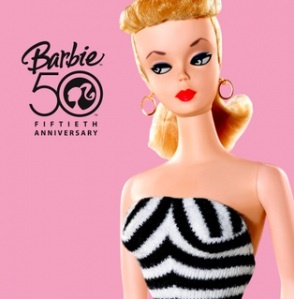 Barbie turned fifty three years old this year. Her relentlessly perky bosom and tiny little wasp waist, pleasantly vague Stepford smile, flawless makeup and hair have remained virtually unchanged for half a century. She has access to an unlimited wardrobe, and shoes to match all her outfits. It’s a safe bet that the Malibu beach house, the dream castle and her other real estate holdings are exempt from foreclosure. The pink Corvette and Hummer aren’t in danger of being repo’d. I turned fifty three years old this year too. My bosom stopped being perky sometime during the 80’s, my waist is more bumblebee-ish, and sometimes I snort when I laugh really hard. As for makeup and hair…well, let’s just say they’re noticeably low on my priority list. I’m lucky if I can find shoes that match each other, much less ones that match my outfit. My farm isn’t in foreclosure and my old truck would scare the peewaddin out of even the most intrepid repo guy, but it’s a struggle to maintain them both. These observations prompt me to dig through a closet to locate my own vintage Barbie. What starts out as a quick search and rescue mission lengthens into most of an afternoon, partially due to the overstuffed condition of the closet, but mostly because any sense of haste disappears when I open the first box of keepsakes. It’s just not possible to sift through the accumulated mementos of a lifetime without lingering over at least some of them. The mostly pleasant memories associated with this jumbled collection settle on me like a comfortable old sweater as I sit in the closet doorway. Several dusty boxes later, there it is; that shiny, black vinyl Barbie doll case. Upon opening the lid, my initially wry, slightly resentful attitude toward Barbie vanishes. I am six years old again, reunited with a treasured childhood companion. She has not changed one bit, and neither has the delight I take in her. I cradle her with hands that have changed from the smooth-skinned ones of a little girl to the work-roughened ones of the woman I have become, but the thrill I feel while rummaging through her accessories is the same one I felt as a child. I allow myself, for a little while at least, to revisit a much simpler past; to sink below the surface of time, immersed in the warm relaxing waters of my youth. Annoyances and worries slide away, and I notice that my breathing is deeper and more even, my heart rate slower and steadier. I promise myself right then and there that I will visit this tranquil place more often. Eventually I notice that the sunbeams slanting through the windows have dimmed, and I somewhat reluctantly resurface into the present. Returning slowly into the adult world, still wrapped in the warm fuzziness of nostalgia, I realize that my Barbie and I have at least a few things in common. We are both classics, perhaps harboring just the tiniest bit of jealousy for those who are younger and hipper. She and Ken parted ways in 2004, I have blue jeans that have lasted longer than any of my boyfriends, so now neither one of us is guaranteed a date on Saturday night. (There were rumors that Ken, in the grip of a mid-life crisis, left her for the much younger Skipper, although personally I always suspected Midge was behind it.) There may be a new romance in her future, depending on the marketing whims of Mattel. Right now I’d rather have root canal than re-enter the dating scene, but perhaps Fate will manufacture a new boyfriend for me, too (preferably on that is anatomically correct). We have both held a variety of occupations over the years, although I suspect her jobs have paid much better than mine. Struggling to rise from the floor, it also occurs to me that neither one of us has fully bendable joints. Making my way outside to feed the critters, I ponder the differences and similarities between Barbie and myself. It sure would be nice not to have to worry about money, to dwell in luxurious residences and drive classy vehicles. How cool would it be to retain the velvety skin and curvaceous figure of youth, with a body that refuses to surrender to the unyielding demands of gravity? I’m not feeling sorry for myself, exactly, just experiencing a vague sort of wistfulness. Settling in on my front porch steps to watch the sun set, though, a sense of peaceful resolution is granted. Surrounded by well-fed, frisky critters as they communicate in muted woofs, meows, quacks and whickers, we watch the brilliant final rays of the evening sun bathe the hills. The vivid indigo, rose and golden clouds are cast into razor-sharp silhouette against the cerulean twilight sky. An equally lucid thought comes to me then – I’ve got a darn good life. There’s my farm, my varmints, and unlike Barbie, more than one lifelong friend, all treasures in their own right. My job may not pay all that well, but it’s fulfilling and allows me to make a positive difference in the world. The memories associated with the items in that closet are priceless. There is so much to be grateful for, even with all the troubles that come along with just being me. Why in the world am I wasting even a second missing what I don’t have, or mourning the inevitable physical concessions to age? I chuckle as I explain all this to the critters, but I doubt they comprehend much of it. What they do appreciate are the skritches behind the ears and smooches on noses as, in a much lighter mood, I head into my own dream house. Life isn’t perfect, not by a long shot: sometimes it’s messy, hurtful and exhausting. Nevertheless, when we open our hearts and our consciousness, become aware of our own flawed beauty, life becomes an experience to relish, not an ordeal to endure. Living in your own skin, wrinkles and all, trumps being plastic and perfect any day. oh this unique the things i require might be. I’m not exactly sure what this means, but I like it, and I hope you liked my post. Thanks for the read and the comment.